When I first came to Turkey, the constant barrage of all things new and in some cases frankly odd, fascinated me. Little Turkish quirks displayed by my newfound friends and learning about daily aspects of life in the country like how to catch the bus, banking systems, and social greetings, made me feel like I had been given a new lease of life. Learning about the culture and traditions was for most parts a fascinating journey into multiculturism, and while all my friends in England thought I was rather brave, I enjoyed venturing into the unknown because it was an adventure. Fifteen years on, and life is still good, but the excitement has worn off. As the years have progressed, daily life has become a familiar routine and I’m used to it. Anyway, the other day, I found myself on autopilot doing an entirely Turkish thing that in England, I never would have dreamed of. Has my cultural self-identity become a two-sided personality, where I’ve subconsciously adopted Turkish mannerisms? Even some of my friends say I am half-Turkish and half British. Does this mean I’ve been Turkified of which the definition is when a person of non-Turkish origin adopts Turkish behaviours? So, I wrote this list of Turkish things that I’ve or my friends have found ourselves doing. How many can you recognise? 1: You walk down the middle of the street when there are perfectly good pavements on your left and right-hand side. 2: You have a Turkish name and actually answer to it as well. 3: When using the hole in the ground toilet, you squat quickly and efficiently, like an army drill sergeant, even if you are wearing trousers. As for the western style toilets, people who don’t use the bum washing nozzle are not normal. After all, a clean, airy, and fresh backside is the pivotal highlight of your day. 4: You have absolutely no qualms about telling someone they have put on weight. 5: You’ve eaten soup for breakfast and even drizzled garlic and chilli sauce on it. 6: You are now an expert on Turkish politics and can easily judge a person’s social class, religious beliefs, financial status, education, and stupidity level, purely by which political party they vote for. If they don’t have any political affiliation, or support an opposing party to you, they are uneducated, have no clue what they are talking about, or are from the village. 7: Your sentences no longer consist of one language. You attempt to speak Turkish, but when you don’t know one particular word, the English equivalent is sufficient, and you’ve made up your own language called Turklish. 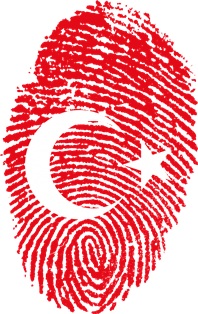 8: Speaking of languages, you can recognise regional Turkish dialects and have a preference as to which one is better. Istanbulites are easy to understand because they speak exactly how your textbooks taught you, but anyone who has a slight twang, accent or speaks street slang is just trying to make life difficult. 10: You have 5 pairs of slippers in your house purely for visitors. 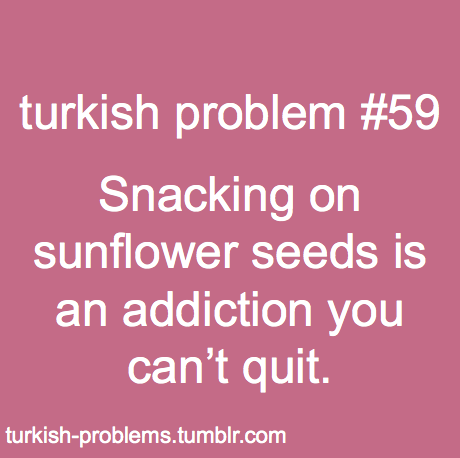 11: You open sunflower seeds (cekirdek) with your teeth and without realizing it, eat a whole bag while watching the world go by. 12: The property market no longer fazes you. You can buy, sell, and flip houses like a stockbroker on speed. Having kept yourself up to date with market news, you know the Istanbul real estate market is prime investment opportunity, and can calculate how much rental return yield, that seaside villa will make you. Any dodgy emlak (estate agent ) who tries to get one over on you, will wish he hadn’t been born. 13: Nobody bothers to hassle you any more. Walking past restaurants is a doddle now, compared to years ago when you had to be rude, run or hide. 14: You have at some point, ridden on a moped without a helmet or with more than one other person. 15: You have watched or taken part in a Kurban Bayram ceremony of sacrificing an animal and despite your western beliefs; find it easier to avoid any moral discussion regarding the practice. Besides, you like taking a bag of meat home at the end of the day. 16: You know of at least 3 Turkish men who think it is socially acceptable to have a mistress. 17: English people think you are rude because instead of saying no, you roll your eyes and tut. They also can’t understand it, when you ask why they didn’t open their phone. 18: Your local corner shop has an exercise book with your name and the amount of money you owe, written in it. Without batting an eyelid, you often pick up a load of goodies and tell them to stick it on the tab as you walk out. 19: As well as being an expert on property in for sale in Turkey, you know everything about the condominium law, and neighbours want to vote you in as Baskan at the next annual general meeting. 20: You get excited in summer when the watermelon man comes around on his tractor. 21: The heat no longer fazes you, and you wonder why you bought that air conditioning unit because not only does it make you sick, but you never use it. 22: You’ve developed a fondness for Kokoreç (Lamb intestines wrapped around seasoned offal) and wholeheartedly recommend it as a suitable alternative to dull kebabs. 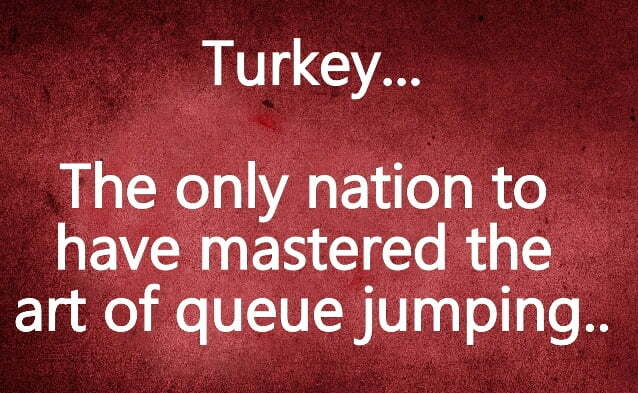 23: Queue jumpers make you laugh. In fact, you can show them a thing or two, because, you’ve disregarded everything your mother taught you about manners and have mastered the art like a professional. 24: Certain restaurants in your hometown are on your “DO NOT VISIT” list because you refuse to pay tourist prices, and if you have to watch another touristic Turkish night show, you could lose the will to live. 26: The parks with the free exercise machines are excellent. Of course, you won’t pay to use them because everybody knows the whole point of them is to meet others for gossip. Why would anyone work out? 27: You refuse to pay 10 lira for a sunbed on the beach and just throw down your towel on the sand instead. Give it a couple of hours and someone is bound to leave anyway, in which case you can jump up and get their sunbed free. 28: The dinner dishes after washing have to be rinsed under running water. Likewise, you still enjoy a bath but have to shower when you get out of it. 29: It is completely and utterly normal to jump into the shower, immediately after making love. Laying in each others arms is unhygienic. 30: When you order in food, it doesn’t bother you that it only costs 10 lira but the delivery boy had to drive half way across town to bring it to you. 31: You like summer because you can move a settee or cooker onto your balcony. It is practical and comfortable, and any foreigner who says it looks ghettoish is stereotyping. 32: It is perfectly acceptable to take to your bed when you are PMTish or menstruating. For these few days, you really don’t care about equality between men and women and when it comes to this opportunity to relax, you are going to milk it dry! 33: BBQs are for any time of the year, even when it is raining or the middle of winter. You also don’t think twice about lighting a BBQ in the middle of a grassy or forested area in summer. 34: If hepsiburada.com(Turkish equivalent of Amazon) had a competition for the most loyal customer, you would stand a good chance of winning. 35: You measure your daily sugar intake by cubes. Loose sugar grains are only for baking. 36: Going for an afternoon pint is such as British thing to do. Now you hang around teashops and can make one tulip shaped small glass of sweet tea last an hour. You are also extremely pleased that you now drink Turkish coffee because consuming something that tastes like mud means you’ve done your bit for multiculturism. 37: Lastly, you know that the local mosque calls out to prayer five times a day, but because you’ve become subconsciously used to it, you can’t remember the last time you heard it. That is a surefire sign that you now act like a Turk! No 37, i hear the call to prayers for the first two days in Turkey, after that, nothing! I love reading your posts. I wonder, has your English accent degraded when you moved here? Ah yes, so true about asking questions for things that we consider are private matters! Can relate to most of these Nat ? Some others which come to mind are; its normal for people to ask how much things cost, even total strangers asking “how much your car”; you never pick up just one or two of tomatoes but fill up a whole bag; you know when its interest day as you always bump into fellow expats at the bank; you no longer get road rage but drive like a crazy person yourself ? I think I can own up to about 5 of these. I did make sure my WC came up to full Turkish standards while I was in the UK, despite having to explain the extra tap to the people who moved in after us. A most enjoyable read on a wet rainy Sunday afternoon Natalie. I’ve often fantasised about living in Turkey. I would never leave my family however love my holidays in Turkey.